770Red Casino is an online casino established in December 2014. It’s a multi software casino, offering games by MultiSlot, Parlay Games and BetSoft software providers. It is New online casino and at this point we can’t say how well it treats players. If you have experience of playing online and wish to try then go ahead. If you prefer more familiar brand with long history, please check our Best Online Casinos listing. Important Update: Unfortunately, we found that the overall level of 770Red casino is below our demands and therefore we cannot recommend it to our players. If you are looking for trusted and reputable new casinos, please check Anna Casino or, the not so new, Royal Panda, which was our best casino for 2014. Both casinos offer great welcome bonuses and free spins. 770Red offers a nice range of slot machines for you to enjoy. In the video slots section you can find 70 three reel and 5-reel slots. We would recommend you to start with Chessmate, Lucky Mermaid and Cinema Classic slots. All three offer 98%+ RTP. Besides the regular slots, 770Red casino has over 50 amazing BetSoft 3D Slots, Good Girl Bad Girl, Safari Sam, Mr Vegas – just to name a few. Video Poker fans have 16 games to choose from: Joker Poker, Jacks or Better, Deuces Wild and more. Other games include Blackjack, Craps and Keno. 770 Red casino is a flash casino. You don’t need to download any software and can play all the games straight in your browser, Windows and Mac. Unfortunately at this point, the casino is not available on mobile. New players can enjoy a 3-step welcome bonus on their first 3 deposits plus 20% cashback. The bonus amount is very good and can get up to £/€/$ 6,000, but we do need to warn that the wagering requirements are high: 60 times the bonus. 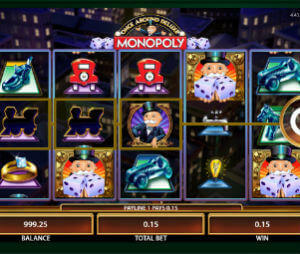 (For bonuses with better terms, you can check our list of Casino Cashable Bonuses). Those of you who weren’t lucky, can take advantage of the 20% cashback bonus. Please notice that the cashback bonus can be claimed only for deposits made during the first 48 hours. Slot Tournaments: Every weekend, you can take part in Red770 weekly event with guaranteed prize pool. The tournament runs from Friday at 18:00 BST, till Sunday at 23:59 BST. The top prizes are £/€/$ 300, £/€/$ 150 and £/€/$ 75. At this point, the variety of banking methods is quite limited, but it does cover all the main ones. Deposit methods: Visa, MasterCard, Skrill (Moneybookers), NETeller, EntroPay, Ukash PaySafeCard. 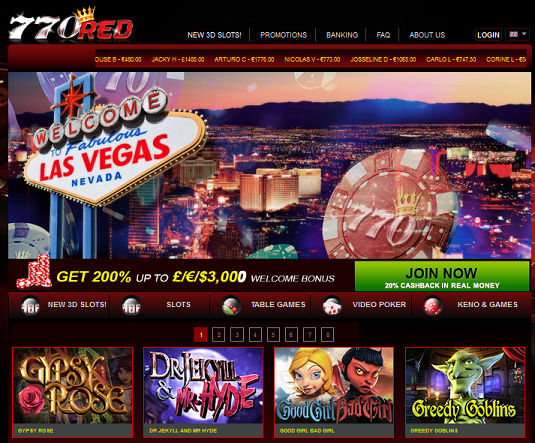 770 Red is a new online casino with great variety of games and high welcome bonus package. Yet, this is a brand new casino and therefore there is not enough history to judge how it treats players. If you are a seasoned player and looking for new casino to play at – go ahead and give it a try, but we suggest to start with small deposits and to pay attention if something isn’t going the way you expect. If you are new to online casino, we recommend that you start with known and reputable brands, which you can find on our best online casinos rating.